and Karen Hansen in BrouHaHa. Photo by Mark Silva. BOTTOM LINE: At the end of the world, a group of clowns searches for the meaning of mortality. “Is this the end?” six Victorian clowns ask, each with an expression of fear and confusion. With their eclectic instruments, gadgets, and stacks of luggage only carried by Ralph (Mark Jaster), they have been traveling on foot, out of time and out of place. And they are here. Indeed, “this is the place." Constantly doing headcounts and fussing over whether everything and everyone is in order, the band of misfits is a charming cacophony. “This is a confusing time but you are not alone” they tell the audience. And all of a sudden, it no longer seems like physical comedy, but a reality that we’re collectively experiencing. BrouHaHa is a charming experience that makes you laugh until you realize there are tears in your eyes. Taking into account the overwhelming refugee crises around the globe, as well as a general sense of unrest, the company turns serious political matters into something poetic and simple, without losing substance. Mortality and departure, explored in depth yet with a touch of lightheartedness, are the central themes of Happenstance’s latest endeavor. The characters call to mind Pirandello and Beckett’s highly symbolic plays, but with perhaps a more cartoonish presence. They are at once vintage, with their Victorian attire (courtesy of Sabrina Mandell) and futuristic, since it’s at times hard to tell if they’re human or bionic being. Either way, in a short amount of time the individuality of each becomes clear. There's the slightly ditsy Rose (Sabrina Mandell); Edith (Gwen Grastorf), the no-nonsense matriarch of the team; and a younger version of Beckett's Gogo and Didi: gadget-master Roland (Alex Vernon) and the fiercely loyal if not simple-minded Ralph. There’s also Big Wanda (Karen Hansen, perhaps the eldest of the performers), the child of the group. 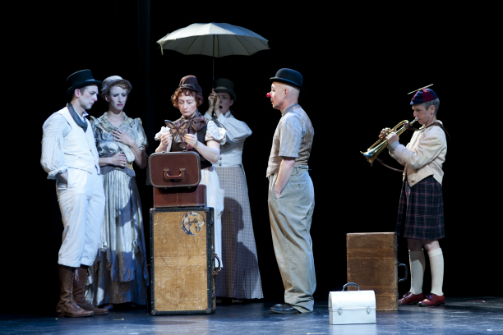 The ensemble mimes almost every action, and accompanies them with practical sound effects; the group's physical comedy and seamless collaboration result in 80 minutes of highly energetic performance. The highlight of BrouHaHa is the Apocalypse Café, where the group sets up shop to take orders from the audience, creating some rather eccentric drinks: a milk shake made from shaking an entire cow. But it's mimed, of course—we can safely assume that no cow was injured in the making of this show. I’ve always had great appreciation for clowns. They are exaggerated versions of humanity, with all their flaws and vulnerabilities visible, and an unapologetic attitude towards being transparent. Clowns reveal the ugly parts of us, those parts we try our hardest to hide because they can be scary to see. But clowns carry a mirror, especially in these uncertain times when apocalypse seems closer than ever. BrouHaHa is by Happenstance Theater ensemble. Music Arrangement and Compositions are by Karen Hansen. Costume Design is by Sabrina Mandell. Lighting Design is by Kris Thompson. Stage Manager is Ellen Rosenberg. The cast is Gwen Grastorf, Karen Hansen, Mark Jaster, Sabrina Mandell, Sarah Olmsted Thomas, and Alex Vernon.